So Berst, you have spent this weekend in town, what have been doing in Christchurch? I was invited by GapFiller, who, from my understanding, are an organisation tasked to basically activate the town centre, and so accompanying that they have been working with Ikarus, Wongi and Emma to bring in and connect with artists from Christchurch and further afield, and they brought me down from Auckland to essentially run a workshop focussed specifically on graffiti. So, during this one-day workshop we had about ten students, so to speak, ranging in age from seventeen to thirty, and they have basically been taught the foundations of graffiti, and within that I’ve showcased to them a little bit about my work, my process, some technical skills, how to construct a piece and, importantly, some of the potential avenues where graffiti can lead. 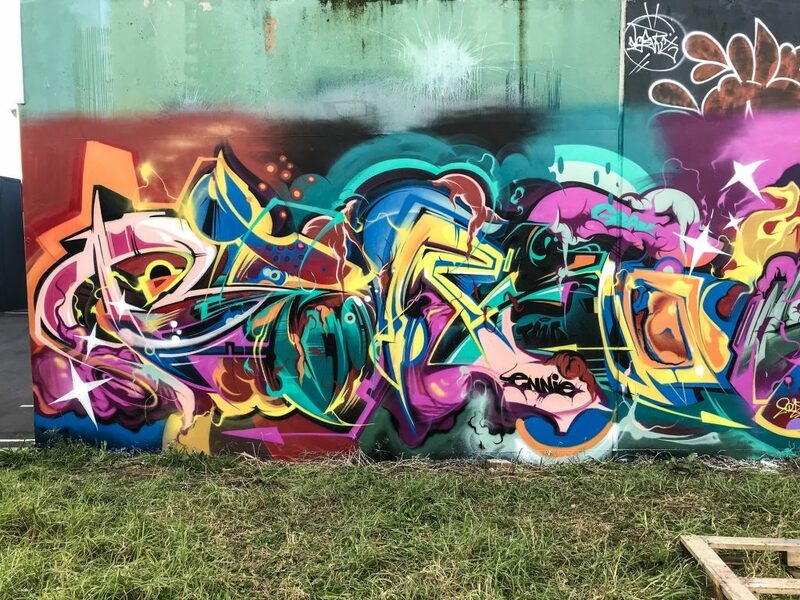 I think that is incredibly important because often a lot of workshops give the technical skills of how to do graffiti, but without really thinking about the potential contexts it can actually go into beyond just being illegal. Then over the last two days I’ve been working on my Real Time web series, which essentially documents and captures the story of New Zealand graffiti. I’ve just managed to film Wongi and Ikarus as part of episodes fifteen and sixteen. That discussion of technical elements raises an interesting question, because historically graffiti has this amazing ‘Do-It-Yourself’ culture, right? There are stories of writers boiling their own ink and making their own marker pens, repurposing the nozzles from kitchen cleaners, that whole development, that history. Now that you can buy all these different caps, and all the choice of paint, what sort of impact does that have? When you are thinking about a workshop, are you encouraging innovation in that sense as well? Is that still central, or is it not present to the same degree because the necessity is not there? They were figuring it out, and they were potentially coming from a low socio-economic background, they were not privileged kids who had everything at their fingertips. 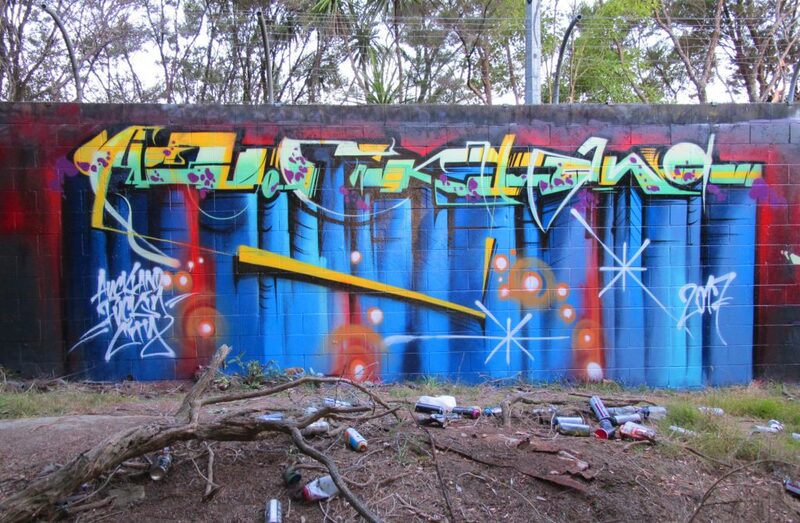 Which is an important and informative background for graffiti writing’s history, right? Because, you know, you’ve got to steal your supplies, at that time we didn’t have the fancy paint, so you were stealing hardware store paint. Yeah, there are YouTube tutorial videos on how to do it. So basically, you put one can in the fridge or in the freezer, one in boiling water, and once one is frozen, you get like a ball point pen and the straw that holds all the ink, and put the cans cap to cap and it transfers. For me, I think that was kind of exciting, because it was kind of like mixing paint, right? That’s essentially what it is. It was exciting because there’s so much more of a process, more than just the painting and the action. But I don’t necessarily cover all that stuff in the workshop because people are probably just there because they want to get into the painting and because it is such a short period of time, we just have to get into it, you know? But, in saying that, with some of the writers back home, these are the things that I talk about with them, in the hope that they will do something great with the tools that they have, you know? What can they achieve now? This is what people achieved back then, and this is what they have done now, what about the future? If anyone in New Zealand is having a lot of discussions with different writers, it is you. 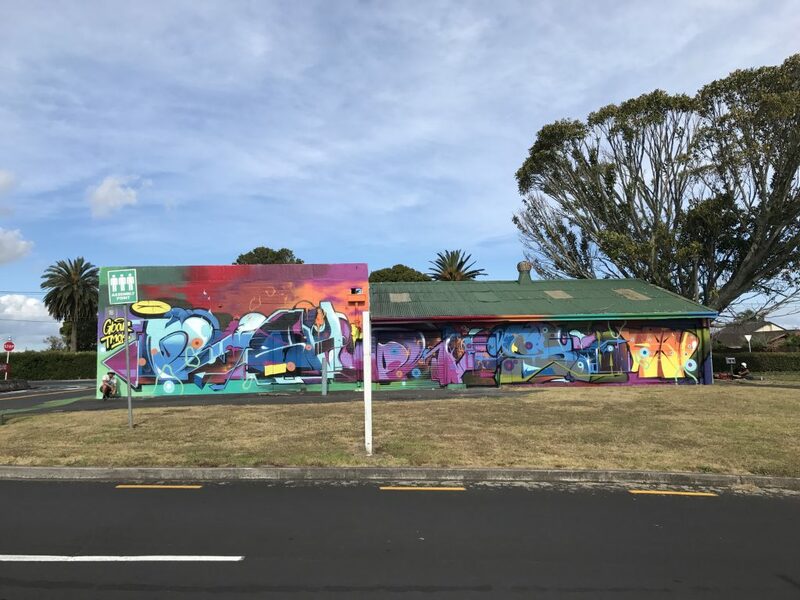 You are definitely a connecting figure in Aotearoa graffiti, what’s your take on your position? I’m an advocate for it, a total advocate. I see the wave of street art, I see that happening. I see the wave of urban art happening, I see the murals happening, I see the post-graffiti happening, and of course, the fine art gallery space thing happening, and I ask myself, why is graffiti not happening? Why is it not moving in that way? That’s not to say, why is it not becoming mainstream? Or why is it necessarily even becoming accepted? It’s not about being legitimised as an art form, it’s not that type of conversation. For me, I feel like again, it’s actually two-fold; it is about realising that graffiti is an art form that is, in terms of generational knowledge, oral, it is passed on verbally. There is something where writers, they take pictures of their own stuff and whatever, but I know lots of writers who are not willing to share this knowledge, which is a weird one, because I see graffiti like a religion in some ways, like when I go out painting at night time or whatever, I’m practicing, and when I have a conversation with someone, when I run a workshop, I’m preaching, that’s actually what I’m doing. I’m very clear in my intentions and my actions. But some people will go out painting and really believe in graffiti, but they won’t preach, they won’t share. So, it is kind of like saying; ‘I’m Christian, but I won’t tell you the beliefs.’ I’m kind of like an extremist of graffiti when I speak to you, you know? Importantly as well, it is something that is understanding and presenting graffiti for what it is itself, it is not trying to fit it into some other narrative or discussion. It is about empowering the culture by celebrating the culture for what it is, and too often, concessions have to made when it comes to graffiti, right? 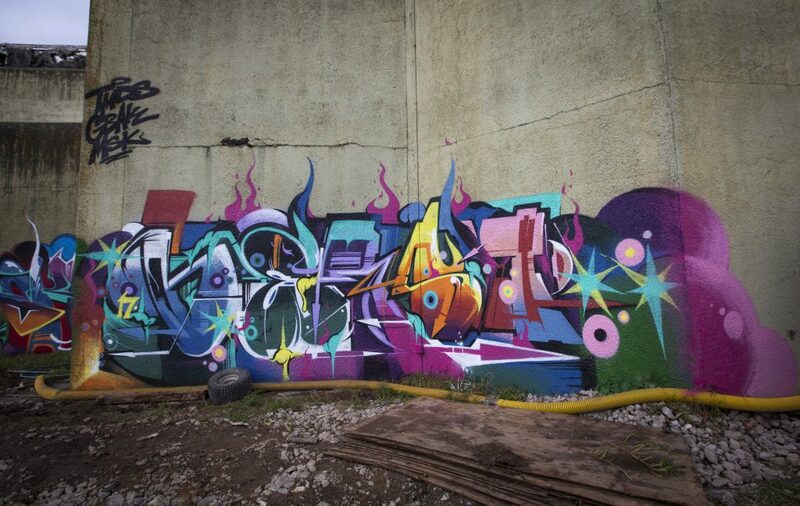 Absolutely, and the common thing when it is portrayed in the media, is that question: is graffiti art? 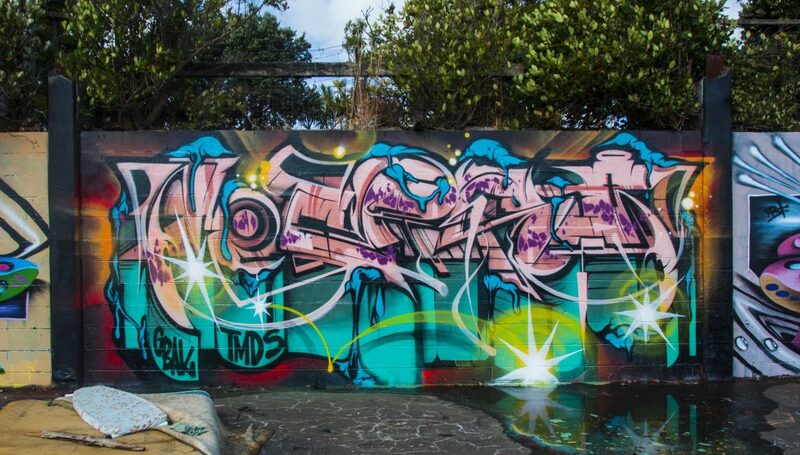 Yeah, signature-based graffiti, it has been around since the sixties, so what is that now? Exactly, what other art form has got such a strong hold on the art scene? And has had that longevity? It is also interesting, because it is something that has developed within society, it’s a social thing. It hasn’t been developed in an institution, like when you think about Cubism, someone inside an art school, they are being told that’s an important art movement, whereas this is something that has operated for fifty years, it’s crazy!